The Solus Organic Wool Comforter has been discontinued. These comforters have been discontinued. As an alternative we recommend the Sleep & Beyond Certified Organic Wool Comforters. Our Solus Organic Wool Comforters are a delightful surprise and forever dispel the notion that wool is heavy and uncomfortable. The pure organic wool is all natural, chemical-free, and unsurpassed in purity; the secret to its lightness. If your current comforter sometimes leaves you too hot and sweaty at night, you will enjoy the breathability of our pure organic wool comforter. Wool's natural ability to regulate moisture and temperature will help keep you cooler in summer and warmer in winter. See all of our Solus Organics Bedding Collection. Wool fill is 100% organic, certified through GOTS. The pure wool is shorn from Corriedale sheep that have grazed only in pastures (Argentina) free from pesticides and herbicides. The wool is washed without detergents, chemicals, chlorine or bleach – just hot water. 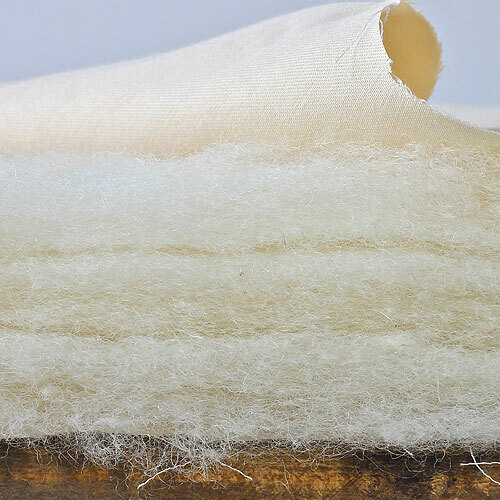 The wool fiber produced retains 3 - 4% lanolin oil; a completely natural dust-mite repellent. Damask cotton is 100% organic, certified through GOTS. It is cultivated and hand picked in the traditional co-operative manner that has been followed for centuries in the Canete and Chincha valleys high in the Peruvian Andes. It is grown organically without the use of synthetic pesticides, herbicides or defoliants to fertilize the crop, control plant growth or fight pests. No synthetic chemicals are used to strip the leaves in preparation for the harvest or during the manufacturing process. It is woven to very high standards into the finest fabrics, in Peru and Belgium. Expose comforter to fresh air: the best way to care for your wool comforter is to expose it to fresh air and sunlight. This process evaporates excess moisture from the natural fibers, and freshens the bedding by eliminating body odors. Place comforter in the dryer: Since airing your bedding isn’t always possible, an alternative is to place comforters in the dryer, using the delicate or air cycle to aerate the items for 15 to 20 minutes. Check the items frequently. Place one or two new tennis balls in the dryer with the comforter to fluff the fibers. Stain removal on comforters - 3 spot cleaning methods: Mix up a solution of 1 part white vinegar to 3 parts distilled water. Thoroughly dampen the stain with the solution, and then expose the comforter to sunlight and air until dry. If necessary, repeat until stains fade and odors dissipate. Alternatively, use a non-toxic spot cleaner as directed. Ensure that the comforter has dried completely before using it. Spot clean comforter with a mixture of borax and water. Add just enough water to borax powder to form a paste. Apply the paste to the spot, and expose the item to sunlight to help fade the stain. (A protein remover such as Bio-Aid or Amaze can also be mixed with water to form a spot-removing paste.) Let the paste set, then brush, rinse with plain water, and allow the item to air-dry. Note: Never use regular dry-cleaning methods with wool comforters. If the methods outlined above are not feasible, a professional cleaning method offered at local dry cleaning stores called Aqua Dry Cleaning or Wet Cleaning can be used. We recommend using a duvet cover to keep your comforter cleaner longer. Our Solus Organics Bedding is committed to top quality, hand-made products that continue to amaze our testing team. The Solus Organic Wool Comforters are made of the finest, purist materials, which makes them loftier and lighter than most of their rivals. Pure organic wool is an ideal choice for a hypoallergenic, luxury comforter that is lightweight, warm, non-toxic, and comfortable. Our Solus Organic Wool Comforters are a great alternative to those with allergies to down or synthetic comforters. 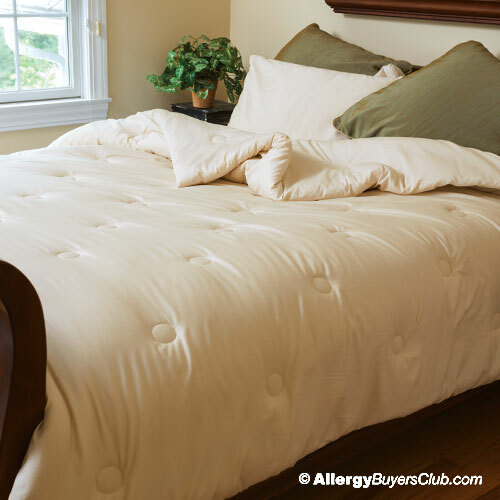 Choose the summer weight comforter if you sleep hot or live in a warmer climate. If you live in a colder region, like New England, the all season comforter is the perfect weight. The natural properties of wool make it an ideal bedding fill as it is absorbent, resilient in form and shape, and dust mite resistant. Its thermo-regulating properties helps keep the wool fill dry, which helps keep you cooler in the summer and warmer in the winter. This comforter is also an environmentally and socially responsible choice. Twin 63" x 86" Summer: 300g/sq.m. Full/Double 78" x 86" Summer: 300g/sq.m. Queen 86" x 90" Summer: 300g/sq.m. King 102" x 90" Summer: 300g/sq.m. Due to Federal Bedding Laws, opened or used bedding is NOT returnable unless due to defect as covered under the warranty. Our Solus Organic Wool Comforters have a 3 year limited warranty. This warranty covers defective stitching, clumping of fill and excessive loss of loft. It does not cover stains, soiling, burns, odors or changes to the fill or fabric due to washing. Washed comforters are void of the warranty.